I completely lost it this week. So many reasons, serious and trivial, but I'll just focus on one of that is neither: Owen's homework. After a peaceful summer I can't believe we've joined this stupid battle again, struggling through dittoed worksheets. He's a dreamy fidgeter who would rather cry, bargain, and draw microscopic Transformers on his eraser than get a job done, and supervising his homework turns me into a witch. I never once had to sit with Isabel when she did her homework. I used to think the mothers who did that kind of thing were overinvolved and silly. I was so smug. I got what I deserved. The kitchen smells like chorizo, there's something wrong with the dishwasher, and it's really, really hot. My mother came over the other night after a rotten few days (biopsies, new chemo starts tomorrow) and I wanted to treat her to an evening of domestic tranquility, but instead I was a glowering witch in a soiled apron and she ended up on worksheet duty. Which, I must say, she is very good at. She's nice, my mom. She's the most enthusiastic and grateful person I cook for. She only mentions the situation in my kitchen window box every few months. Anyway, I made a tinga Poblana -- it was sort of a stir-fried stew -- that included pork shoulder, chorizo, potatoes, and canned chipotle chiles, using a recipe out of Rick Bayless's Authentic Mexican Cooking. (I am focusing on a single book by Kennedy and Bayless each night, so I can determine their best work.) I've been picking dishes that look easy, and this was that. We ate the tinga (I feel inexplicably creepy every time I type that word) with the incredible fresh tortillas from the Azteca Market which are soft and puffy and chewy. You can buy these tortillas by the dozen still warm in plastic bags and I can't get home from the store without eating one in the car. Homework remains a minefield, but we seem to have come to an end of the food fights. Owen ate seconds of the tinga -- rich, spicy, brick-red, delicious -- a dish he would have cried over just three months ago. As I type, macho boy is eating leftover tinga for breakfast with scrambled eggs. I also made a jamaica cooler from the same Bayless book. See photo at top. Ha! I bet you thought it was sangria, but we're cleaning up our act. I saw the dried jamaica flowers ($3 for a giant bag) at Azteca and bought them because I knew they'd be good for something, and I was right. You steep the petals in boiling water, add sugar, strain, chill. There's an astringency to this drink, like cranberry juice, that we liked a lot. You can find a recipe here, though it is slightly different from the one in the book. In other news, there's a rooster in the neighborhood, I heard him crowing yesterday and again today. He is not ours. I had no idea there were any chickens at all in the vicinity, and I really want to meet the person who owns this rooster. Maybe she is a female with medium-sized children who is also losing it. We can become best friends. Also, Owen started 4H yesterday. He loves it. 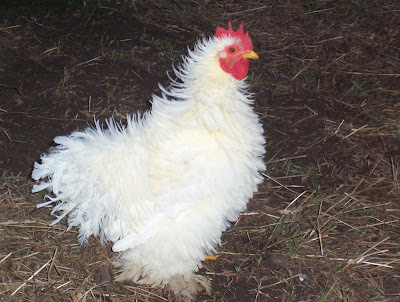 At the 4H host's house we saw our first "frizzle" hen and I am posting an internet photograph of a frizzle chicken because it's one of the funniest animals I have ever seen. I love the frizzle hen. I also have to fight with my son over homework until I had to put him in aftercare run by teachers. He finishes before I pick him, ensuring pleasant evenings. Quite a bargain for $7 a day. Last year , they even offered reading tutoring. There is a reason I'm not a teacher. Healing thoughts for your mom. This is from FlyLady on August 24, 2009 -- hope it helps! Now for the routine is that is going to help you have more time for yourself. It is your after school routine. The children are not going to like this, but you are the director here and this is an important lesson for everyone. As soon as you all walk in the door. It is time to start homework. Now don't shake your heads no! Hear me out. If you put it off till later; later becomes the evening and then everyone gets stressed out. Now is the time to take care of homework and get it out of the way so your evenings can be spent doing family stuff not stressing out over homework. I realize that the children have been in school all day but use the fact that they are in this routine to their advantage. Now I know that all work and no play makes Jack and Jill unhappy campers. You are going to have to reschedule your shopping runs till after the homework is done. Do not get sidetracked taking care of the things in the afternoon and put your children behind the eight ball when it comes to their homework. We can make this fun. Use your timer. Set it for 15 minutes and tell them that if they will work steadily; not speedily or half done that after the timer goes off that you will let them play for 15 minutes. You have to be firm. Do 15 minutes of homework and 15 minutes of play; keep repeating it till all the homework is done. You will be so surprised at how fast they will get their homework done. Now here is another good thing about using the timer. You can get dinner started during the 15 minute session and play when they play. Do you see the example you are setting for them. A timer is a valuable tool for keeping us focused. We have never been lazy. We just want to have fun. Using a timer allows us to focus on what we have to do and celebrate when it goes off with a little enjoyment; the best of both worlds. Routines are not the straight jackets we have always thought that they were. They free us up to have fun and keep chaos from hurting us and our children. Use them and you will learn how to be organized. Take babysteps in establishing your routines and let your timer help to keep you and your babies focused on the fun things in life." Love your Blog! We also struggle at homework time. For us the worksheets are a killer. There is too much information at once. Our son was not able to just focus on one problem at a time so we use a blank sheet of paper and cover the problems leaving only the problem being worked on showing. For us it helped a lot. I'm way too removed from the homework scene to be of any use, and you never needed any prodding or help anyway. But I am very close to the Tinga, having just finished the leftovers you gave me for lunch. It was without doubt the tastiest stew or chili I have ever eaten. Your mother makes me miss my mother immeasurably. You are so lucky. May the new regimens go easily and successfully. Already dreading the homework battles here which I know are coming with Son 1. (And I am pretty confident they won't with Son 2, though both continue to surprise.) Good luck. If you are EVER in need of an appreciative audience for your gorgeous (and I'm sure delicious) food, call and we'll be right over. I read all the time and never comment, sorry. I may actually make the tamal, which sounds so good that it makes me overcome my usual new recipe inertia. Sorry about the homework blues . . . I think there is way too much homework for the younger kids in our education system. The kids do get too much homework. And if they don't do it, what then? I mean, how does an eight-year-old's homework focus impact his self as a 38-year-old? Personally I think most homework is a waste of time. And when I was a teacher I dreaded correcting it. But Fly Lady's routine with the timer sounds brilliant. I do know that timers work wonders! (I don't know why but they do) and the relief of having it done seems to open up the whole evening to smiles. Excellent point of view about the sangria, I think you're doing an important blog, specially if we are talking about this cook issues, and I've wondering about Azteca Market and their tortillas!